Do you lose your keys frequently or find yourself reading things multiple times to comprehend them? 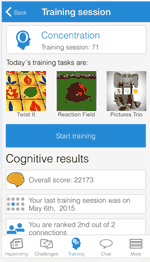 You may want to put your brain to the test with one of these brain training apps. These companies claim that you’ll see improvement in your memory, problem-solving and comprehension if you spend just 15 minutes a day (or every other day) playing brain games. There are also some people who believe doing puzzles and cognitive training can help keep dementia, Alzheimer’s and other memory loss at bay. It seems like a worthwhile investment to play some games today, especially if it make you a little sharper today and keeps you sharp into your later years for a better quality of life. All of these programs are available as apps too so you can use them while enjoying your morning cup of coffee, on your commute or during your lunch break. So let’s see if these games for the brain can help you find your car keys! 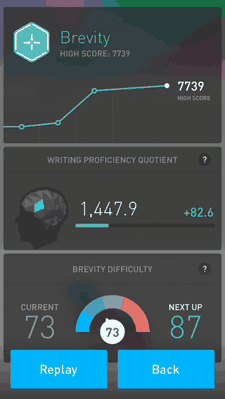 You may feel like you’re back in 11th grade English while you’re using Elevate Brain Training. Elevate is designed to improve the way you speak, write, listen, read and more. This is a very different focus than its competitors. The games focus on enhancing your reading comprehension, improving your vocabulary and looking/listening for grammatical errors. The goal is to refine your communication skills and help you focus. While competitors focus on shapes, patterns and colors, Elevate focuses on the spoken and written word for its games. The games are short and fun though, so hopefully it’s more entertaining than your high school English class ;). You can truly see your improvement when using Elevate because you’ll notice a difference in the way you speak and a more rapid ability to comprehend things. However, if you aren’t confident in the English language (specifically spelling and grammar) you may struggle with this program. You probably think of Lumosity immediately when you hear brain exercise games. That’s because they’ve really upped their advertising. But, are they really the best? 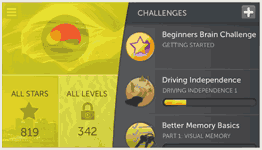 Lumosity focuses on training your memory, making decisions and paying attention to details. The memory exercises are quick yet challenging at the same time. The muted colors may make you feel like it’s more of a learning tool than a fun, mobile game. So, you may feel like you’re doing work instead of having fun. These memory improvement apps all revolve around the same idea and Lumosity was close to taking the #1 spot. However, we didn’t feel like we could justify paying three times as much as Elevate for basically the same thing. Fit Brains comes from the creators of Rosetta Stone, a company that is best known for its language learning software. This says to us that they are a company that is dedicated to helping us learn in ever-innovative and fun ways. The Fit Brains program is easy to use and nice looking. The downside is that the instructions aren’t easy to understand, so you may not perform as well as you could. It’s also a very expensive program, should you choose to upgrade. However, the FitBrains games are fun and they are available in multiple languages which makes it a good option for users around the globe. Want to see who didn’t make the cut? Below are the other brain exercise apps we reviewed that didn’t make our top 3. In addition to improving active memory in the casual user, many of these programs originated in scientific studies, memory and mental health treatment. In fact, our research found that some psychologists and memory-impairment doctors use cognitive training as an important element of patient therapy. Brain HQ’s predecessor, Posit Science Brain Fitness Program, was used to help seniors improve their memory and listening skills. Today, BrainHQ is aimed at all adults and helps with the items above and more. You can design your own training or have BrainHQ pick your exercises for you. The exercises help you work on your attention, memory, intelligence, navigation, brain speed and people skills. You can track your progress as you complete exercises and get feedback on your performance. The primary complaint is that it feels a lot less fun than our top 3 picks and a lot more like a scientific study. Cognifit focuses on helping people with diseases, illnesses or other impairments. The program can be purchased for individuals, clinicians, schools, researchers and families. It is meant to help with brain training and improve your cognitive skills with the use of brain exercises. Unfortunately, there is little about them online so we don’t feel like we can recommend them at this time. Are you unsure about brain exercise games? You’re not alone! Many people are skeptical as to whether or not these memory exercises actually help you or if they’re a joke. Watch this video below to see why they work! Did you know there are also apps to help with autism too? Or you might try one of these courses to challenge your mind. Have you seen improvement in your memory, processing speed and problem-solving since using a cognitive training program? Brain games have to be challenging. BRAINHQ is the one that works. 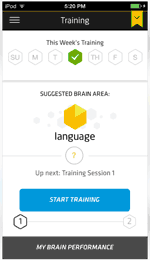 Lumosity was fined for false claims for 2 million dollars. I have used both Lumosity and elevate over the years. I prefer the latter. It feels more rooted in the real world. Diana, thanks for sharing your experience with us! 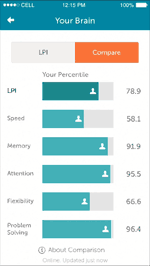 I use Lumosity and it definitely has helped me in decision making. Howard, that’s so great to hear, thanks for sharing! Tap to open and close the mouth and make sure the required quantity of food bits is eaten: no more, no less. This soucnds easy, but controlling 2 or 3 eaters simultaneously is a real challenge.